The mortgage meltdown had many players, from Main Street to Wall Street, and in between. Each acted in the space created by the others. It was an interconnected system that sucked both good and bad mortgages from local real estate markets, packaged them into Residential Mortgage Backed Securities [RMBS] and then remixed them, or links/references to them, into Collateralized Debt Obligations [CDO] -- both real and synthetic. Figure 1 below shows the main roles in the mortgage pipeline from Main Street to Wall Street -- the flow is from left to right. The flow may have originally started as a "push" from Main Street, but soon turned into a high demand "pull" from Wall Street -- they could not get enough mortgages [both good and bad] to mix into ever more complex investments. Fever and activity on one end of the system was soon felt at the other. The synthetic CDO that has gotten much attention in the summer of 2010 is Goldman Sachs' ABACUS 2007-AC1. It is the focus of a criminal charge brought by the U.S. Securities and Exchange Commission against the investment bank Goldman Sachs. In 2009 and 2010 I assisted investigators of mortgage fraud in the Slavic Village neighborhood of Cleveland, Ohio. They focused on the criminal behavior of local mortgage brokers, real estate appraisers and flippers of houses financed with sub-prime mortgages. Mark Kellogg, a mortgage broker, was a high profile conviction of the local county prosecutor. is the activity on Main Street connected to Wall Street? are any of the Slavic Village bad mortgages in a Wall Street RMBS/CDO or referenced in a synthetic CDO? Several foreclosed mortgages, from Kellogg's real estate deals, sit in a Long Beach Mortgage RMBS that is part of the referenced portfolio of Goldman's ABACUS 2007-AC1. One deal is illustrated in Figure 2 below where we have replaced the generic roles shown in Figure 1, with the real Cleveland actors who participated in the deal. Figure 2 was not the only foreclosure from Cleveland referenced in Goldman's ABACUS, and Cleveland was not the only city contributing both good and bad mortgages that were referenced by ABACUS. Figure 3 shows how Goldman's ABACUS was made up of references to many RMBSes. Each RMBS contained hundreds, if not thousands of sub-prime mortgages from all over the U.S.A. The blue node in Figure 3 represents Goldman Sachs' ABACUS 2007-AC1. 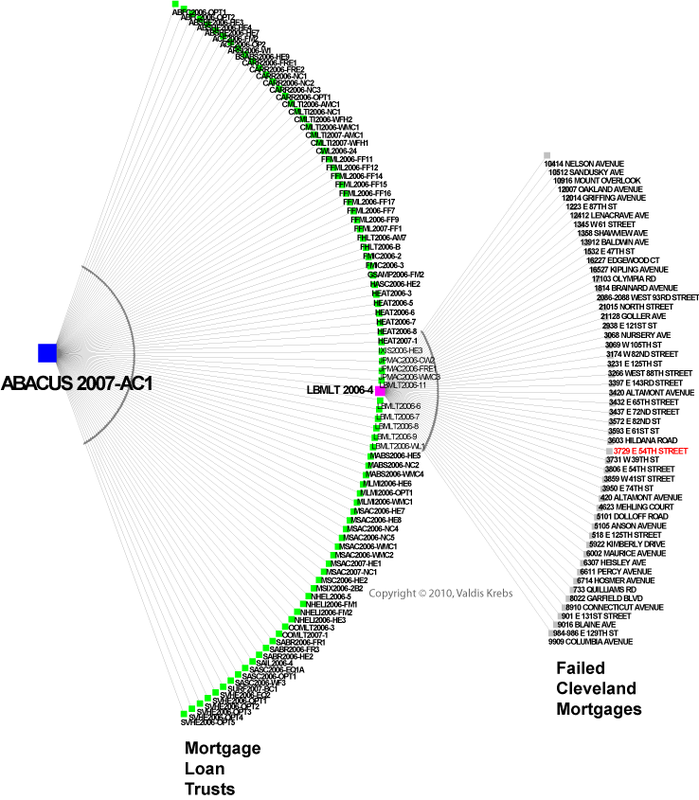 Flowing into Goldman's ABACUS are references to mortgages, each packaged into a RMBS [green nodes] shown in the arc to the right of ABACUS. They have names such as ABFC2006-OPT1, LBMLT2006-4, and SABR2006-FR3. The final arc shows all of the foreclosed mortgages [grey nodes] from Cuyahoga County [Cleveland] flowing into RMBS LBMLT 2006-4. Thank you to SEC Info for great access to SEC filings! Each of the green nodes above [RMBS] will probably have a similar arc of failed mortgages flowing into it -- different arcs from different cities. In addition, other failed Cleveland mortgages probably flow into the other RMBSes detailed in Figure 3. It is a mess, and part of the reason it is a mess is because the obfuscation of the details prevents both investors and investigators from understanding how the investment functions. Complexity forces people to rely on the opinions of others -- such as the rating agencies who rated these pools of mortgages as high grade investments. Obviously the rating agency also did not understand the composition and dynamics of what they were rating. 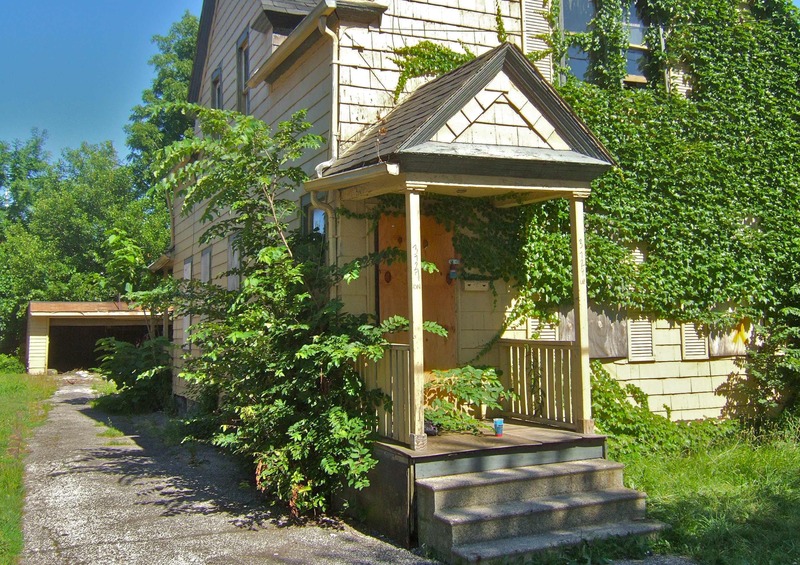 "...the obfuscation of the details prevents both investors and investigators from understanding how the investment functions"
One of the failed Cleveland mortgages that was included in a Wall Street CDO -- "3729 East 54th" -- is shown above in Figure 4. We see the local neighborhood effect of the subprime hysteria of 2001 to 2008.